The wedding we hosted this weekend for our youngest daughter was wonderful. 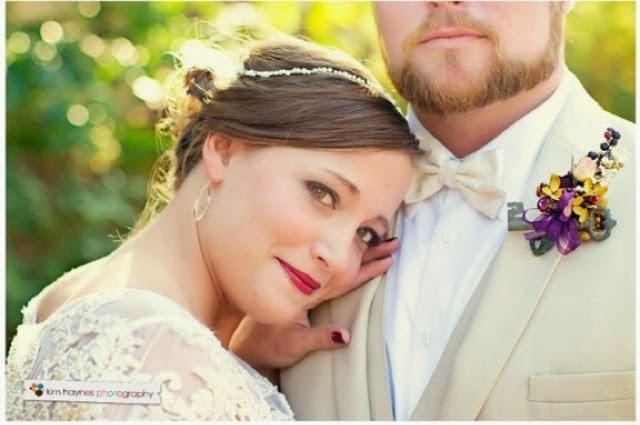 The bride and groom were glowing, the weather was fabulous and the event was perfect. We are so grateful to friends and family for helping us pull it off. I love this photo of the couple standing on the aisle runner I painted for them. I didn't know until afterwards that our fabulous photographer, Kim Sanders Haynes had captured this shot. We had never hired a caterer before. Our kids were so excited to have a popular taco truck cater our event. 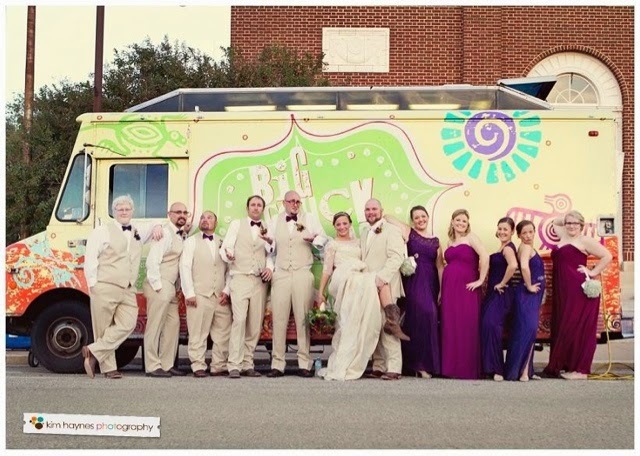 It was fun to have the truck park outside the venue and serve our party. 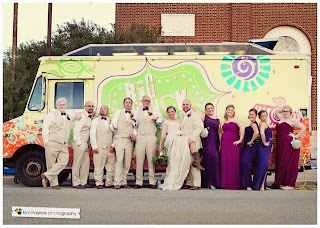 I love, love, love this photo of the bridal party in front of the truck. Big Truck Tacos is one of the most popular restaurants and taco trucks in our state. The owner is originally from our little town. 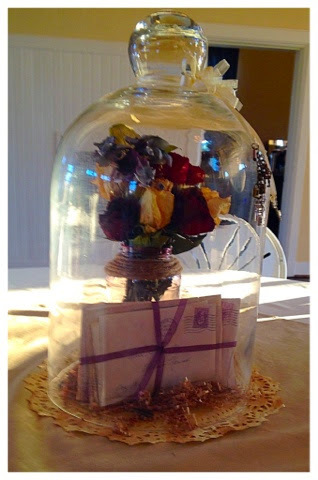 It took months to collect the special items we used inside individual cloches (bell jars) used for centerpieces on each reception table and all around the venue. Since the wedding and reception took place at an old post office we used a postal theme in lots of places. The letters inside the cloches are reproductions I built of love letters my mother and father had written to each other in the 30's. The flowers were dried arrangements created from flowers the groom had sent the bride over the past few years. She saved everyone of the bouquets. Who doesn't like pie? Our family made over 100 little jar pies as gifts for our guests. We also had a full sized pie bar. The ceremony took place in a garden outside the post office. 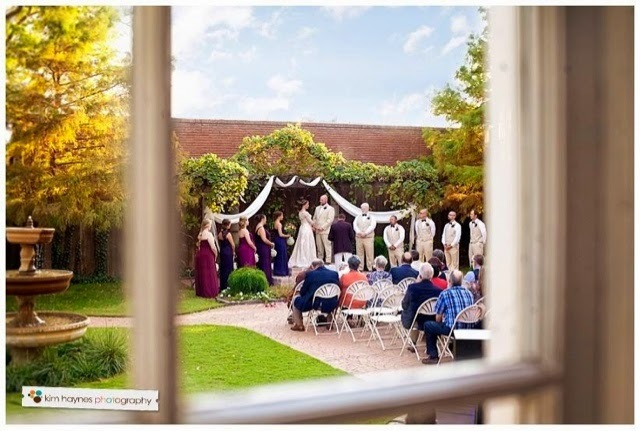 It was a beautiful setting and we were blessed with great weather. I made all the dried flower corsages and if you look at previous posts you'll see the faux keys I made out of hot glue. They held up great and looked so good. 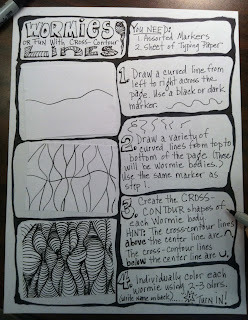 I was thrilled to see everything come together. I believe the success of a wedding is happy bride and groom - the rest doesn't really matter. All the months of work was totally worth it to see the joy in my daughter's eyes. She was a magnificent bride and was the queen of the day. Thanks for sharing our very special occasion! What a wonderful day of memories! 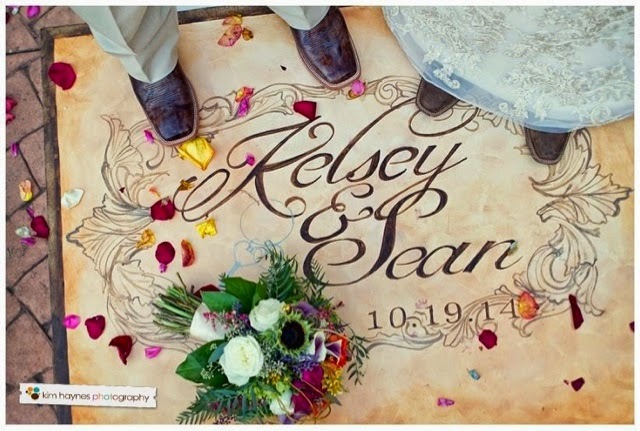 I love all of the personalization that went into this wedding making it one of a kind. Congrats! 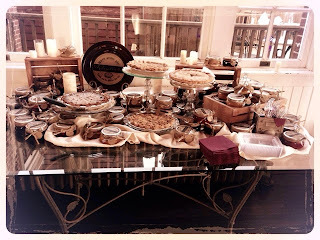 It looks like all your hard work & imaginative ideas produced a great wedding celebration. "Little jar pies", I had to google it; what a fun idea & great gift anytime. Thank you so much, friends, for your sweet comments. We really had a Pinterest wedding. We found the jar pie idea there and ran with it. They were a HUGE hit and easy to make. Congratulations! It was a great memory and an inspiration. 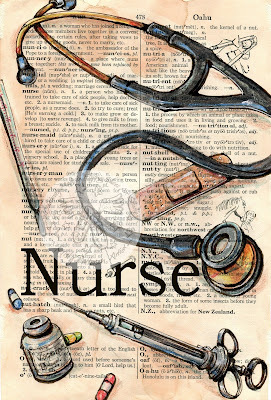 I love the pics. I'm just been reading your blog and its really interesting!